Robert Eggers’ The Witch came out of nowhere and instantly blew everyone away. Initially premiering at the 2015 Sundance Film Festival, where it was awarded the prize for best directing in a feature film. Afterwards, it was bought and widely released by indie darling A24, garnering extremely positive reviews and healthy box office returns. There were, of course, detractors. People who claimed the film wasn’t scary enough and that it moved slowly and uninterestingly. This list strives to prove those very people wrong, and convince them why is it that The Witch is one of the finest horror films of the 21st century. There is a reason why people are generally afraid of witches. Not just of witches per se, but also of ghosts, demons, vampires, even clowns. All these iconic figures have social and cultural constructions behind them. Growing up we learn of their evil natures and become aware of how they would behave, or what would they want with us were we face to face with them. All the famous folklore icons of western culture have, however, sort of lost their punch. Their figures have been tremendously watered down by pop culture and, in many instances all that’s left is a shell of their original form; an easily accessible and marketable totem. The fear and apprehension that encircled and originally gave birth to these legendary creatures is but a tiny fraction of what it was. The Witch managed to change that. It explored an iconic figure of horror folklore and literature in its primitive basis, by carefully studying documented 17th century rumors and tales surrounding witches. The film had a team of experts bent on analyzing how witchcraft was perceived in that period and how a real witch was believed to behave and look like. They even went so far as to study rumored compositions of magical lotions, all of which made it into the film. 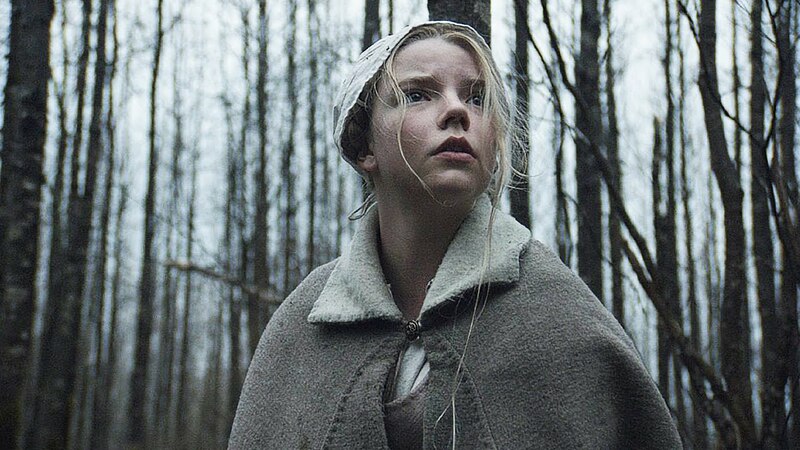 Setting itself 400 years back in time, and drowsing its atmosphere into a believable representation of what it must’ve been like living in 1600’s New-England, allowed the movie to better explore the witch’s figure in its spine-tingling origin. Long gone is the big-nosed, broomstick-riding old lady so famously – and exhaustingly – depicted in film. In here, the titular witch is legitimately petrifying: a grotesque figure roaming in shadows and cruelly tormenting a family. Every second of screen-time she has is filled with dread and anticipation, especially so because it reminds the audience what it is that makes witches so damn terrifying. Jump scares are a plague of modern horror films. Picture the scene: a couple walks a secluded cabin in a forest. The wooden floor creaks as they make their way towards a closed door. Its knob is moving from the inside. The boy places his hand over the knob and yams the door open, only to find no one inside. The couple turns and BAAAAM a loud screeching noise explodes the audiences ear drums when they hop into one of their friends at the hallway. Ring a bell? Yeah, that’s because it’s in every major horror movie you can think of nowadays. They’re distracting and incredibly annoying. That’s not to say jump scares cannot be used effectively – James Wan and Sam Raimi are two modern filmmakers who know how to make good use of them – but they are so commonly employed in a cheap and predictable manner that it destroys any suspense or atmosphere the scene might have had. A good horror film isn’t necessarily the one that makes you jump in your seat the most times; it’s the one that leaves you curled up in that seat, shivering from head to toe due to unbearable dread and tension. Not unlike a thriller, a great horror film gets you by the throat and doesn’t let you go. Robert Eggers realized that from the get-go. During the entirety of The Witch, there is but one instance of a jump scare, and it is a mild one compared to how explosive they usually are. The Witch focuses on tension. Slow and agonizing tension, ever ascending and building the sense of ominous evil that surrounds the characters. It’s the slow zooms, the murky natural lighting, the careful plotting. The Witch invests in atmosphere, which is the most essential feature of a good horror film: if you’re not caught up in its vibe, then it’s not going to be effective in its terror. Were Eggers to indulge in loud noises and cheap tricks every time the tension mounts, The Witch would have never been as scary as it is. And we would be a hell of a less thankful about it. Think back to some of the best and most iconic horror films. There’ll usually be two types of problem characters face: the natural and the supernatural ones. Natural problems occur when the characters are thrown into their predicament through the actions of a person. This will usually be a ridiculously resilient killer like Michael Myers in Halloween or Pamela Vorhees in Friday The 13th. Supernatural problems depend on supernatural entities’ involvement. Those can be ghosts or demons or anything in-between. In most cases the supernatural will act through natural elements, likely through possession (The Exorcist) or psychological manipulation (The Shining). The problem, however, isn’t the most prominent issue. More important than the problem is how the problem affects the characters, and most importantly how it affects the relationship status between the characters. If you strip away the supernatural element, The Exorcist is the story of a single mother’s powerlessness in coping with her daughter’s inexplicable ailment. The Shining is about an isolated family having to survive the father’s mental breakdown and sudden violent and even homicidal urges. The more relatable the shift in status, the more effective the problem will impact the audience itself. The Witch smartly presents two relatable shifts in status. One which is familial – after all, the family is torn apart by the evil actions of its titular character – and the other which is religious. At the very start of the film, the family is excommunicated from church and society due to the father’s difference in interpretation of the bible. Later, when the family’s baby goes missing, the young Caleb appears to be distraught with the thought of his unbaptized brother’s torment in hell. His father’s inability to claim that his brother is safe in Heaven (given that that would contradict his dogmas) also brings much pain to all. The issue of doubting one’s faith then becomes increasingly apparent as the story progresses. The father’s blind belief, his scalding of his daughter once her faith is weak, the mother’s desperate crying and praying. The Witch is a portrait of an orthodox family’s mental and spiritual collapse. The fact that it is brought about by a satanic witch only adds more wood to the fire. Ambience and atmosphere are two of the most essential features a horror film needs to get right. The viewer must be completely entranced by the feel of the movie, the aura that encircles not only the characters but also the experience itself of watching the film. Atmosphere is created in many instances. There are of course the visual responsibilities that come with it: lighting, costumes, set design, camera movement. All must contribute hand-to-hand towards the movie’s final goal, which is to scare and terrify its audience. However, one cannot ignore that immense impact a chilling original soundtrack holds over a horror film’s allure. Mark Korven’s work elevates The Witch’s tension to sky-high levels. Shades of Penderecki (whose music famously played into Stanley Kubrick’s The Shining) are clear throughout, what with its screeching violins and minimalist cacophonous approach. In many instances, the score’s instruments seem to mount on top of each other, like a tone cluster of harmony, ever ascending on pitch and intensity. A seemingly tranquil melody thus becomes a dense and disquieting cavalry of wind and brass assaulting the ears. There’s a sense of urgency in the score that adds to and surmounts the ambience the film establishes. The slow screeching strings give way to agitated thumps and nightmare-inducing choir compositions during the film’s tensest scenes, before a foreboding viola announces the unrelenting threat that remains ominous. Korven’s score is a beautiful companion piece to the film’s plot, as it carefully paces alongside the movie’s fluctuation in terror and suspense. It’s a wonderful example of a movie elevated by its score, and a score elevated by the imagery it accompanies. Eliciting the audience’s empathy towards your character is an essential step in good storytelling. If the viewer doesn’t care about the main character’s predicament, then everything is just bound to go south one way or another. That is especially true to horror films. Think of your typical teens-chased-by-murderous-slasher movie and you’ll see that, typically, there’ll only be around two characters the audience connects to the most. Needless to say, those same two characters will be the final survivors; meanwhile the other ones (the cannon-fodder characters) will be rapidly dispatched. Developing the characters, therefore, is extremely important. But it doesn’t matter how great a character is on page if there isn’t a good actor who can transport that to the screen. Robert Eggers care and awareness of that fact really shines in The Witch’s casting. It’s a limited cast, comprised of six actors. While that could have resulted in a movie lacking in substance, here it is an advantage to the film, as it allows the screenplay to better develop its characters. Ralph Ineson’s performance as William, the father, dominates the movie. His impossibly low and guttural voice, his imposing physicality, his conflicted faith and overall nature. It works wonderfully to indicate the family’s relationship dynamics, as he is clearly the leading figure in it. Just as compelling is Kate Dickie’s performance as Katherine, the mother. Distraught by the loss of her baby boy, Katherine’s despair slowly turns to hatred and aggression. Dickie really sells her character’s descent to madness as the hands of nefarious witchcraft. Harvey Scrimshaw’s take on the doubtful pubescent Caleb is efficient, as the young actor showcases his character’s fear and guilt in subtle ways. He also impresses during his exorcism scene, as he is wholly consumed by energic insanity. However, there is no denying that the true MVP of The Witch is Anya Taylor-Joy as Thomasin. A blooming teenager encircled by a world of sexism and male hierarchy, Thomasin’s struggles with handling the guilt of losing her brother and with witnessing the collapse of her family. As she is wrongly accused of Satan worshipping, and begins being pursued by her own relatives, Thomasin defenseless pose and despair is beautifully rendered through Taylor-Joy’s lost eyes and perturbed stare. One of the oldest rules in filmmaking can be summarized in a well-known saying: show, don’t tell. That means to say that if you have the choice of audio-visually showing an occurrence or happening on screen, instead of simply featuring a character talking about it, you should go for it. It is the more appealing and captivating approach, that betters explores the cinematic language to its fullest extent. That does not make it terminally prohibited to not show something on screen. Omission can be as important and effective as full-blown exposition, if properly employed. All depends on the filmmaker’s intention. There are certain occasions where a film takes a half approach to such dogma. It balances the “showing” and “telling” bits and combines them into one, into a sort of cautious exposition. The Witch features this slight cheat in its most terrifying instances. The titular witch is never properly seen in her original form. When she’s on-screen she’s usually bathed in shadows and faced away from the camera. The shots do not linger long on her, instead choosing to cut to black or simply cross-cutting to a scene featuring other characters. Like an incomplete mosaic, she is never fully depicted, which forces the audience to solve the puzzle of her appearance and behavior. Thing is, as the film brilliantly constructs atmosphere, the audience’s fear and tension lead to an increase of the witch’s impact upon the viewer. Like a real witch in the 1600’s, she feeds on your terror to better prey on you. Eggers pulls this off incredibly, lending frightening credibility to the witch’s mythical figure. What the director does is the visual equivalent of an urban legend, as he adds to the iconography of its fearsome and villainous protagonist but doesn’t spoil it by going too far in its exposition. Film is a lot like music. Melody and harmony intertwine to tell a story or convey an emotion. Film and music have their motifs, themes that repeat themselves throughout and constantly call back to previous instances. They also rely on following the rhythm that will better express whatever it is that the filmmaker/composer strives to achieve. A film can move slowly or rapidly. It can vary its rhythmic speed both in the editing of its arcs – even though that rarely pays off – and of its separate scenes. However, the rhythm must always be continuous and cohesive, never dragging or rushing extensively. The Witch is a prime example of a rhythmically balanced horror film. That’s not to say it moves frenetically, constantly presenting conundrums and problems the characters must solve so that the story can progress. The Witch moves slowly, patiently. It recurrently adds fright over tension so that its more deliberate pacing becomes increasingly agonizing for the audience to watch. There is seldom a release in tension, and even the scenes in which the most disturbing imagery is revealed are always carefully and meditatively delivered. The movie also manages to balance various themes within its running time. Not only is the subject of witchcraft explored, as other profound motifs – such as crisis in faith, the mental impact of religious fundamentalism and the struggles of a maturing girl in a male-dominated environment – are properly introduced and fleshed out. These themes are also essential to understand the characters and the way the witch takes aim at their innermost fears and troubles to corrupt them. Author Bio: Fernando Pompeu is unashamed to admit he loves Batman and Robin. He just tries to hide that information behind a lot of Bergman and Tarkovsky films. He also has a small production company.